Discussion in 'iPad 2 Forum' started by mason123, Apr 5, 2011. Why?? Anyone know? Also anyone know any matte finished protector without the lines? I have one for my iphone matte finished and doesnt have these lines. The matt screen protectors have a rough patterned surface designed to break up light reflections making them appear less reflective - only a reduced amount of the light is reflected to your eyes and the rest is reflected elsewhere at different angles. The pros of a matt screen protector are less reflections and also less resistance making swiping or stylus use smoother. The downside is that same rough pattered surface has a similar effect on the light passing through it which is why matt protectors usually don't appear as bright or as vibrant an smooth ones. They also slightly distort the image being displayed by the screen giving the image artifacts you are noticing like patterning and jaggy lines. I use an antiglare matte protector from Brando and I don't have any of these "jagged lines' issues with it, nor does it appreciably reduce the brightness of the screen. It does, however, cut down heavily on the reflection especially when using outdoors under semi- or direct sunlight, or indoors under fluorescent lights. There is a slight pixellation to the display, but you'd need a magnifying glass to tell the difference: under normal usage it is barely noticeable. Brando actually make very good products and as you have just highlighted - not all screen protectors are made the same. 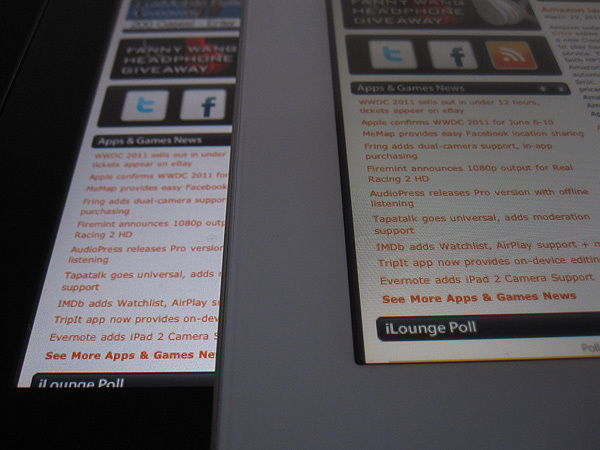 If you compared it with a naked screen though, the difference is still appreciable. I used a matte protector on my iPad 1 and I thought that it worked fine until I got my iPad 2. Then I saw just how much it cut down the brilliance of the screen. Since then I had Ghost Armor protection applied and it not only protects but the reflectivity is cut significantly. It is great. It also eliminated the smudging. Of course, but that's exactly the point of using a matte protector: to reduce the ambient reflection/glare from bright overhead source. By habit, I set my brightness levels to fairly low, as bright screen displays give me a headache after looking at one for too long. Thanks guys for the reply. I have ordered a Brando one from their site. Will update this post when I get it next week. So after about a month I finally got the screen protector. This one is a matt finish with no lines at all. When its on the screen it has a paper fell to it, making it much easier for your finger to slide and very minimal fingerprints. I'd say it lose about 5% clarity on screen but for the anti glare and less fingerprints its worth losing for. How was the installation process - easy or hard? I have my Steinheil UO screen protector ready for the ipad that's coming this afternoon.